Hercules is a constellation in the northern part of the sky. It represents the mythological Hercules of Greek mythology. 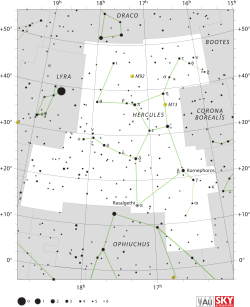 It was one of the 48 first constellations listed by Ptolemy and is now one of the 88 modern constellations. This page was last changed on 24 January 2019, at 15:37.